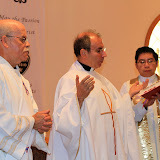 During 24 years, a team of Augustinian Recollect catechists worked together in translating the Bible from the original Hebrew, Greek and Aramaic into “Quiché”, the ancient language of many regions of Central America. On March 24 of this current year, the results of these labors were officially presented to the public in the parish of San Miguel Archangel , Totonicapán. The organization and coordination of this project took place under the direction of Father Bernard Goose, a French priest and Lic. Sucuqui Mejia, a native of Chiche (Quiché, Guatemala). The Augustinian Recollects will mobilize for the next World Youth Day which will be held this coming August in Madrid, Spain, more than half a thousand youth coming from the different groups that belong to the RAY (Recollect Augustinian Youth/Spanish JAR). The more than 500 young men and women will come from the 14 countries where the Recollects are present. The youth will participate also in an encounter prepared by the Order, an encounter which was timed to coincide with some activities of the WYD. Benedict XVI has begun a new cycle of catechetical instructions dedicated to Christian prayer. Week by week, the Pope will be expounding on a topic to which Augustinian Recollects are particularly sensitive: prayer. The Order was born in sixteenth-century Spain as a movement of religious renewal that dedicated several hours a day to prayer.